Now it’s getting exciting. The Fuggle hops are really starting to fly, and the Crystal malt bags are piling up so high you could make a Burning Porter fire. OK, so that’s a horrible analogy. Point is: this is serious. 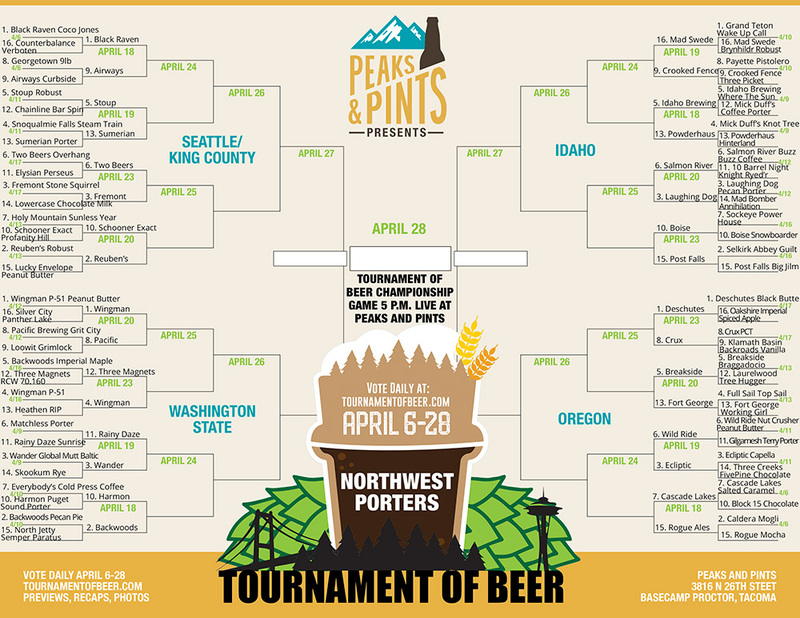 Today the Tournament of Beer: Northwest Porters officially kicks off its Second Round, meaning 32 Northwest porters remain, and the competition is as hot as ever. What porter will be crowned Saturday, April 28? The path to porter greatness starts today. Here’s a recap of yesterday’s battles, and a look at today’s Tournament of Beer action. Sink your nose into the pint if you know what’s good for you and get rolling. In Greek Mythology, Perseus used Medusa’s head to turn his enemies to stone, thereby rescuing his mother. Perseus then lived a long and happy life with his mother, children, and wife Andromeda, where he eventually died and achieved Elysium. In Tournament of Beerology, Perseus Porter was crushed by an Overhang — and by Overhang we mean Two Beers Brewing’s Overhang Bourbon Imperial Porter with 83 percent of the vote. Two Beers Overhang moves into the Second Round. 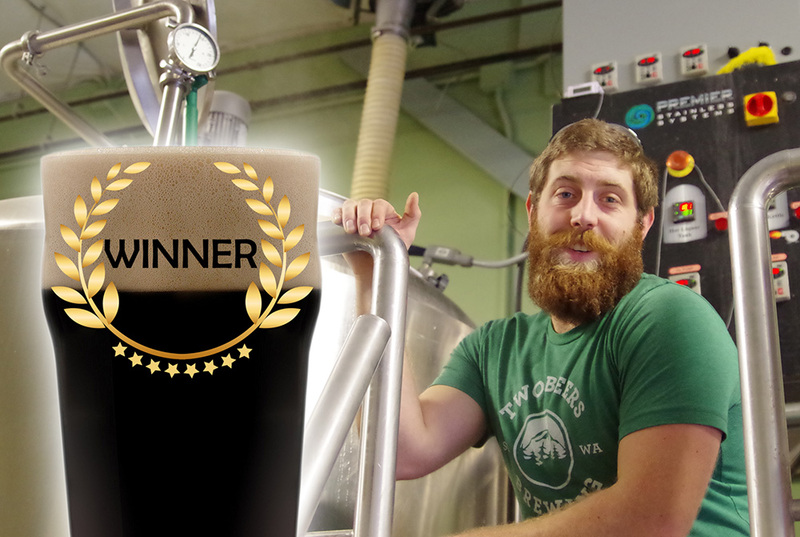 In the closest battle of the day, Fremont Brewing’s Stone Squirrel Porter foraged 55 percent of the vote for the win. Surprisingly, Lowercase Brewing’s use of only lowercase letters wasn’t really a factor. Once Fremont busted out the squirrel Youtube videos, it was over. Stone Squirrel moves into the Second Round with an April 23 date with Two Beers Overhang Bourbon Imperial Porter. Someone alert Seattle Mayor Jenny Durkan. It’s safe to it would have been an upset of monumental proportion had Oakshire’s Imperial Spiced Apple Porter somehow managed to defeat No. 1 seed Deschutes Brewery’s Black Butte Porter, but — alas — it was never meant to be. Black Butte Porter dominated from tip-off to the final seconds yesterday, collecting votes at almost a three-to-one ratio. Word was passed via southbound hikers on the Pacific Crest Trail that Crux Fermentation Project’s PCT Porter was battling Klamath Basin Brewing’s Backroads Vanilla Porter. PCT hikers headed north crammed Clif Bars and picked up the pace. Soon, Crux’s taproom in Bend was packed with stinky, dirty people pairing PCT Porter with their trail mix. You can’t deny the power of PCT people. Crux’s PCT Porter moves into the Second Round with 62 percent of the vote. Black Raven Brewing and Airways Brewing have rabid fans and die-hard supporters, as well as worthy porters, so this porter match-up may be the maltiest contested of the competition to date. Black Raven’s Coco Jones Coconut Porter is a rich brown porter with flavors of caramel, chocolate and, of course, coconut, plus the brewery’s ninth annual Flock Party is May 5 with what seems like a hundred Black Raven beers on tap. 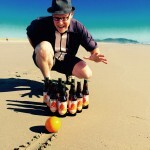 Airways Brewing’s Curbside Porter is a London-style porter with pronounced roasted chocolate and Airways has a new seasonal mango, lemon, and stone fruit IPA called Spiral Staircase. Mobile your base, Black Raven and Airways, and get out the vote! Harmon Brewing’s Puget Sound Porter has all the malts for big flavors of chocolate and coffee, plus a Tournament of Beer voting machine in their Harmon Tap Room. Backwoods brews a dessert-ish Pecan Pie Porter with caramel, chocolate, vanilla and subtle pecan, as well as hosts inspirational Facebook posts. We don’t know where we’re going with this, so maybe you should just vote. Some folks were worried about last summer’s eclipse? They imagined worst-case scenarios of motoring along a winding mountain road with a few thousand other excited eclipsers fearing an overheated car and the National Guard telling them to turnaround. Also, since they watch way too many horror movies, the thought of something lurking nearby once it became dark was a constant. Of course, everything turned out fine. And they joined hundreds saluting the eclipse with an Idaho Brewing’s Where The Sun Is Still Shining Before the Eclipse roasty porter. Most folks were excited about seeing the eclipse lika a kid going to Disneyland. These Mickeclipseneers happily hit the hinterland, traipsing through the trees with their special eyewear. For these folks, Powderhaus Brewing brewed the rich, robust Hinterlander Porter. The eclipse is behind us, but this match-up is very much front and center with all Idaho eyes upon them (except those 30 people who looked directly at the eclipse). Newport, Oregon has 27.8 percent more rainy days and 8 percent more sunny days than Bend, Oregon. Newport is 39 percent less expensive than Bend. Newport is 67 percent less densely populated than Bend. People are 22 percent more likely to be married in Bend than Newport. How will these statistics play in today’s Newport versus Bend match-up? Probably a 3 percent chance the stats matter. Tournament of Beer statisticians say Newport and Bend are 100 percent better off having Rogue Ales and Cascade Lakes Brewing, respectively. There’s a high percentage you’ll vote for one or the other.